With the economy on the brink and elections looming, Congress approved an unprecedented $700 billion government bailout of the battered financial industry on Sept. 3 and sent it to President Bush who quickly signed it. At its core, the bill gives the Treasury Department $700 billion to purchase bad mortage-related securities that are weighing down the balance sheets of institutions that hold them. The flow of credit in the U.S. economy has slowed, in some cases drying up, threatening the ability of businesses to conduct routine operations or expand, and adversely affecting consumers seeking financing for mortgages, cars and student loans. Some state governments have also experienced difficulty borrowing money. On Friday, 91 Republicans joined 172 Democrats to support the bill, while 108 Republicans and 68 Democrats opposed it. Twenty-five Republicans and 33 Democrats switched their votes from "no" to "yes." Following Monday's vote, Senate leaders quickly took custody of the measure, adding on $110 billion in tax and spending provisions designed to attract additional support, then grafting on legislation mandating broader mental health coverage in the insurance industry. The revised measure won Senate approval Wednesday night, 74-25, setting up a furious round of lobbying in the House as the administration, congressional leaders, the major party presidential candidates and outside groups joined forces behind the measure. Despite occasionally strong criticism of the added spending and tax measures, the maneuvers worked — augmented by a sudden switch in public opinion that occurred after the stock market took its largest-ever one-day dive on Monday. "No matter what we do or what we pass, there are still tough times out there. People are mad — I'm mad," said Republican Rep. J. Gresham Barrett of South Carolina, who opposed the measure the first time it came to a vote. Now, he said, "We have to act. We have to act now." "How can we have capitalism on the way up and socialism on the way down," said Rep. Jeb Hensarling of Texas, a leader among conservative Republicans who oppose the central thrust of the legislation — an unprecedented federal intervention into the private capital markets. 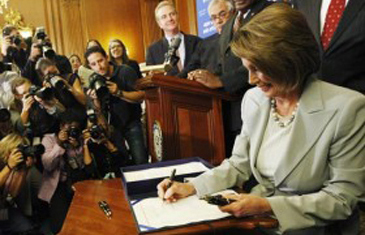 Pelosi said, "We must win it for Mr. and Mrs. Jones on Main Street." One month before Election Day, the drama unfolded in an intensely political atmosphere. Members of the Congressional Black Caucus credited Obama with changing their minds.